A small finish.... yes, it's really small. But it is done. I started it at the beginning of April. You can read about the start here. And the pattern is available here. It didn't take long to finish. (I really liked that idea!) I asked Pat to make a different stand for my bunny. You can see the original one where the patterns are shown at the link above. Of course, now I need to come up with some more little hangings. That will give me some small designing experience since I've wanted to design more of my own projects. I did pretty well on my goals this week although I didn't get 2 pillowcases cut out. I'll try to do that today so I have them to take with me on retreat. Yep it's RETREAT WEEK. Sharon's coming up Wednesday and we're heading off on Thursday morning. This year we won't make it as early because if we leave really early we'll end up sitting in rush hour traffic. Bummer. But we'll have plenty of time to sew! I don't think I'm going to do any fabric shopping this year. It's all about the sewing. My goals were mostly achieved. I didn't get the pillowcases cut out. 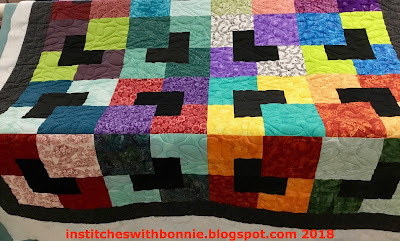 On the other hand I did get the quilt above quilted and it wasn't even on my list. Not a bad trade off. I've got two more quilts I'd like to get done between now and Thursday but I'm not holding my breath. RETREAT FUN! Enjoy myself and sew like a demon! Unfortunately, the Retreat Weekend is the same weekend as my neighborhood chorus and the Spotsylvanians' concerts. I dropped out of the neighborhood chorus but I've gone to all of the Spottsy's rehearsals. So if Sharon and I get back in time, I plan to sing on Sunday afternoon. I'm off to cut out some pillowcases! Before I go, let me remind you that I'll be linking to Oh Scrap, Monday Making, Moving It Forward, and Design Wall Monday. I will be spending some time surfing the Internet this week. You can get so many good ideas! Labels: Design Wall Monday, goals, Hands 2 Help, Monday Meanderings, Opportunity Blocks. 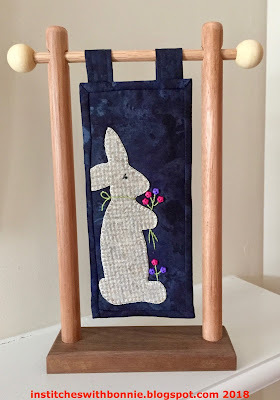 I LOVE that tree and quilt combo that you have going on in your cover photo, and the bunny is adorable. Fantastic work! The bunny is adorable, and that lovely mini stand is asking for the opportunity to display even more mini quilts. Have fun at the retreat. Have fun on retreat this week! I love how you put together the opportunity blocks! Such a cute little bunny! Love the stand. The opportunity quilt is sure to be well loved. Great guest post! Oh, my goodness, you and I have a lot in common!! Featherweights, Berninas, longarm quilting, AND singing in multiple choruses! But there's one more thing -- I, too, have been procrastinating the making of pillowcases! Well, it's more about not enough hours in a day and prioritizing more urgent tasks than procrastination, really. I have a really expensive Sferra comforter cover made from high thread count, finely woven ivory jacquard sheeting that I purchased years ago for a Queen bed before we switched to the King. It has been folded up in the linen closet ever since, with no bed to adorn yet too nice to get rid of, and then recently I had this epiphany that I could cut it up and sew it into a bunch of King pillowcases. But first I have to finish the quilt that I want to give to my friend when I see her at choir practice tomorrow night. It's quilted, trimmed, and I stitched the label to the back of it yesterday, so all that's left is to bind it and launder it to remove all of the starch, markings, etc. I hope you have a WONDERFUL time at your retreat!